From around 1pm today the RAFAs or Richard Attenborough Film Awards winners will be announced live on www.lovefilm.com. As you must by now know The Establishing Shot was nominated in the Best UK Film Blog site of 2011 category. So if I can manage to get a break I'll be heading to the Richard Attenborough Film Awards later today. If you have a wry sense of humour it may be worth watching to get a glimpse of my faux humility when The Establishing Shot doesn't win the best UK Blog category me showing support for the other fine blogs nominated in The Best UK Film Blog site 2011 category. If you are there today, say Hi. 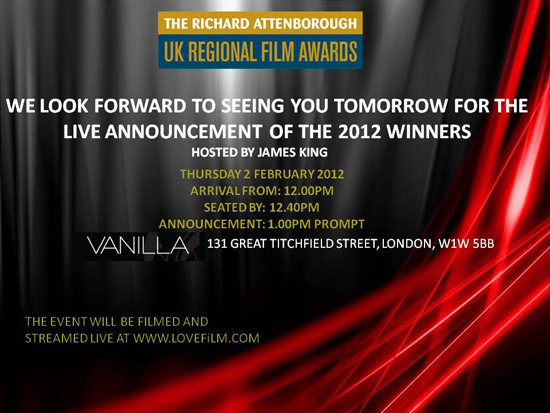 If you aren't going - you can watch James King make the announcements live on www.lovefilm.com from around 1pm today. On the awards official site www.filmoftheyear.co.uk/. you can find information on previous winners as well as the nominees for the 2011 Awards including: Best British Film, Best Animated Film, Breakout Star, 3D Film Of The Year, Film Star, Film Character Of The Year and Family Blockbuster of the year.